I am a 35-year old woman, married to my husband for 5 years (we have been together a total of 11 years). I have a 13-year old stepson. We have had a nice relationship for many years. Lately he doesn't open up to me and lies a lot. I am very connected with his teachers and have an open conversation with his mother. He is failing everything in school and has basically given up. We have exhausted all resources. We ground him, take things away (games, computer, TV), we even sent him to military camp last summer ($3,000.00 wasted). We told him he could not go on his class trip if he failed this semester. He didn't even try, so we cancelled his seat on the plane. His mother is going to take him to a psychologist. I am just beside myself and so worried about him, he refuses to do any work. He just gave up on school. He tested gifted and is very intelligent. He doesn't seem to respond to either positive or negative reinforcement. I can understand your concern about this boy but I think his parents should be most concerned with him and I see that they are. But I would suggest that you take him to lunch or to the park where it is nice and have a talk with him. Find out what he has against you, his parents, and together, come to some understanding. Perhaps he would prefer to live with his mother? In that case - talk to his parents. He is showing you that he is angry in his situation right now and either you, his parents, or the psychologist will get to the bottom and help all of you with this problem. The important thing is that you cannot lose this boy. I recently received two wedding invitations, and the weddings fall on the same weekend: one Friday and the other Saturday. I am not sure how to handle this since both are cousins of mine from opposing sides of the family. I asked my mother, and of course, she thinks I should attend her niece's wedding. My father has given me no feedback (my parents are divorced so they will be attending their respective family members wedding). I don’t want to upset anyone, but I am really unsure how to handle this. I considered trying to attend both but it is not feasible since they are just too far from each other. Any ideas on how I could handle this situation without making anyone too upset? If at all possible, arrange to go to both weddings -- maybe to the ceromony of one and then the reception for the other. I have done that after explaining it to the couples. They can easily understand and will be glad that you can make an appearance. Or you can go to the one you are closest too and explain to the other and plan to invite them over to your house after their honeymoon. Try the explaination and see what happens. Which ever way you decided, they are your cousins and you will not lose them. I've been dating a girl for the last six years. We met freshman year of college, and things have always gone well between us. Our senior year of college we often spoke about spending the rest of our lives together, and when we graduated we decided we would try to make things work between us. Then she moved to another city for law school and I moved away for a job. Although it has been rough, we managed. I truly feel that she could be the one for me. Now that she is graduating from law school, we were planning on moving in together. I decided to take our relationship to the next level. I went out and bought a ring and proposed to her. However, she said she couldn't marry me... because of the ring. She said it was too small, and if that's all she was worth to me, then she didn't want to be with me. I don't understand it - what does a ring matter? I could afford a larger ring, but I don't see the point. I love her and she loves me, but I can't believe she is going to let this determine the outcome of our relationship. Have you ever heard of anything like this happening before - any suggestions? I can understand how your girl feels. Every girl would like a big ring to show off to her friends and a little diamond will not fill the bill. If I were you, and you said you could afford a larger ring, and you both love each other, so why don't you exchange the ring? I know of many young couples who shopped together for the ring and then they come to an understanding about the size. Being in the store and viewing the expense may make your girl see things different. You may find that you will get a little bigger ring and then again you and she will decided to keep the one you bought. When you talk about the expense of making a home for the two of you and the expense of a wedding, she may feel very different about the size of the ring. I might also add that you can view the ring as an investment. Diamonds increase in value all the time. If this is the only problem you have, discuss it a little further with your girl. There will be many problems in the future after you are married so start with this little one and good luck. I have been a reader of your blog for several years and really enjoy your advice. You have seen a lot, and you have had a life experience similar to mine, in the case of a long-distance relationships. I am a freshman in college, majoring in journalism. I enjoy my university very much, and plan to stay there for the duration of my college years. My boyfriend and I have been together since high school, and once we are out of school, we plan to marry. My senior year in high school, my boyfriend attended a college about 45 minutes away from our hometown, and he came home almost every weekend to see me. I felt very guilty that he spent so much time with me, because he made very few friends at school. I also felt guilty because my father did not permit me to drive to see my boyfriend at school, so my boyfriend was spending gas money and logging the miles. He hated school and decided to take a semester off. He thought about what he wanted to do with his life and worked a full-time job while he thought about it. While he was taking his break from college, he would often visit me once I started college. He finally decided he would attend a local university and commute from home. We will now be an hour and a half apart. What do you think is the best way to spend time nurturing our relationship without interfering with our studies? We talk daily already. We love each other very much and it is hard to be apart so much of the time. However, I know that our future is important as well, and it is important for both of us to get good grades. Also, he is thinking about transferring to my school. What do you think the best living situation would be? We had discussed getting an apartment, but I worry that our families will think it is improper. However, we will be 21 and 20, all "grown up." Maybe we should just request dorm rooms near each other. Sorry about the terribly question! What do you think would be the best choice for my situation? And please donÂt feel terribly pressured! I just think you are a very wise lady and think your input could be valuable. Thank you so much, Bubby! I think that the best that the two of you can do it concentrate on your school work so that you will get good grades that will look good on your records when you graduate. At that time you will be more mature and will have met other young people. You may change your mind about this young man or he may change his mind. Don't tie yourself down to him alone. Wait and see what both of you will do at the time you are a little older. Your feelings may change by then so be free to decide. Also I think your father is right when he feels the way he does. Listen to him - he means only he best for you. Just be a friend to this young man for now. Happy Passover everyone! We hope you enjoyed your seders and that you scored big when you found the afikomen. 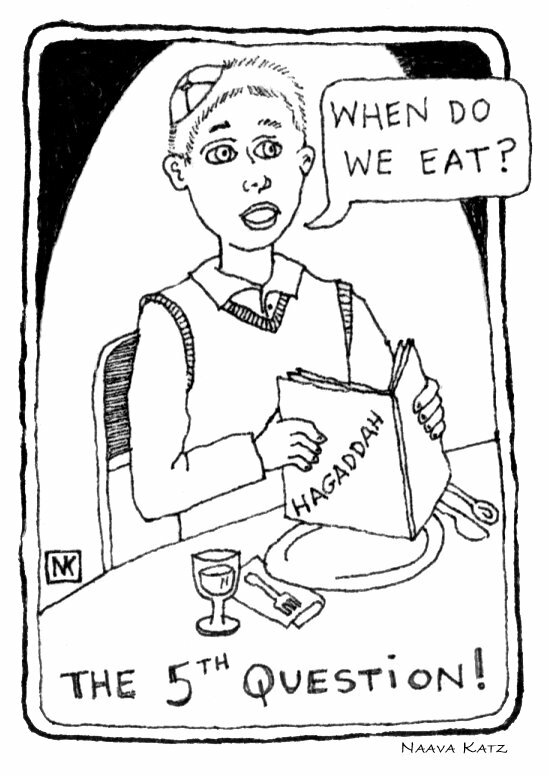 But if you're already sick of matzah, or need a good laugh to get you through this week-without-bread, then check out these fun Passover cartoons. I'm fourteen years old and in the eighth grade. I'm in band, have many wonderful friends, get great grades, and live a wonderful life. I had a pretty big crush on this boy. He was in many of my classes, rode my school bus, was my very close neighbor, and friend. I think he liked me back too. This was the high point in my tale. This boy was in sports. One day at a game, there was an accident and he got a concussion. When he didn't show up at school for over two weeks, I got worried. I went to his house to see how he was. I rang the doorbell, and when he came to answer it, he didn't recognize me. He looked at me in a strange way and said, "Who are you?" This really frightened me. I told him my name, asked if he remembered anything about me, or school. He said that, yes, he remembered his family and a few of his very close friends. But nothing else. I talked to his mother, who told me that he was suffering from huge, irreversible memory loss. At school, he didn't remember his classes, most of his friends, his teachers, etc. He did remember information that he'd learned at school, basic life skills, English, but not people, places, or "classroom rituals." He'd forgotten me, and I was heartbroken. It was as if I'd lost a piece of me. What made me feel worse was that now that people began taking advantage of the situation. I heard some of the meanest things possible being said to him. People were asking him if he remembered who his girlfriend was (he didn't have one). Then he dropped out of our school. I have the power to tell him that people were lying to him. Should I? Or should I just let it go? I'd really appreciate some insight on this. "Should I, should I not?" I think the best thing you can do is check on this boy from time to time. His mother can tell you how he is improving in regaining his memory. I am sure he must be going through medical care or rehab care and it will take time. I would recommend you don't make a pest of yourself. Leave him to his professional care and hope that he will eventually regain his memory. My best to the boy and to you. Well I was wondering if you can help me. I HAVE GUM STUCK IN MY PANTS!!! I don't know what to do. Last night I tried to take it off and I managed to take some off, but now it looks like a stain of dudu in my pants. The pants have been in my closet for about 2 1/2 months now. They are so cute and I don't want to get rid of them. --GIRL IN NEED OF HELP!!!!! I think the best thing that you can do is either throw out those pants or if you think it is worth keeping them, take them to the cleaners. They have a lot of ways of getting out the stains of gum from your pants. Then they can get out the dudu stain as well. If they can't, then just throw out the pants and go buy a new pair. You should have taken care of them at the time the "accident" occurred - it may be too late now. Your cleaner will be the final judge. OK. So my parents go to work and leave me alone for most of the day. So I usually go to my friend's house. Well, the other day my friend had to leave and I got jealous that she was going somewhere with her family. It made me feel like I had none. So I called my mom on my cellphone and asked what time she would be back. When she got home, she started on a rampage about how I can't take care of myself and she has friends who have kids that can stay home alone all day. Then she said, "If you're gonna be like this, then you might as well live with your Daddy!" Am I wrong for wanting a family? Mine is obviously dysfunctional, but am I so wrong for wanting some quality time with my mom? It seems like her job is more important than me and I hate it. She's been horrible to me for the past 2 years. Plus, my dad hates me, for some reason, and they're going through a divorce. I have no clue if I want to stay with either of them. What is the legal age to be "separated" from my parents (I forgot the word)? I really want out of this. Neither of them care if I'm happy or not. Just as long as I do my chores and my homework and not bother them. I felt really sorry for you when I read your letter, but look at it this way. This gives you a way to learn to take care of yourself. Has your mother laid down certain rules for you to follow while she is at work? Does she call you during the day to see if you are OK or need anything? Are you not in school while she is at work? That is where you belong. Do you go to the library until she comes home? Why don't you sit down with your Mom and tell her how you feel. I am sure she works so that she can support both of you. You could try getting a babysitting job after school that would take up your lonely hours and you could have a lot of fun taking care of a neighbor's baby. Did you ever try to get dinner ready and surprise your Mother? At 13, I think you can do it. Give it a try or do the marketing for her so she can get home earlier. Try some of these suggestions and let me know how you made out. I'm a 30-year old lady. I am getting married in 3 months time and I'm confused. How does one get married, and go for a 2-year masters program abroad the next year, and have children and keep a home? I'm so confused I can't think. You can do all those things that you plan to do with just a bit of planning. Many girls do. Make yourself a plan and stick to it. You can get your Masters right here in this country - no need to go abroad. And while you are studying, you and your husband can decided to have or wait to have children. There are many women who decided to become mothers at 33 or even a few years more. And, there are many pregnant women who can handle both a baby and a study program at the same time. You might have to give up some social life but it can be done. Your husband can help keep your living quarters neat and clean as long as he agrees on your plans. The important fact is you and your husband must make these plans and in time they will all fall into place and work out. And then again, many women wait until their children reach school age and then go back to school, and that is OK too. You are never too old to learn. Make your plans with your husband and stick to them.